OMG it's just so freakin cute! Sometimes you want to go somewhere on your motorcycle but you have to carry stuff that’s large or awkward. Sometimes that means you make provisions like specific luggage or extra tie downs, and sometimes it means a full custom rebuild. Of a Honda Cub. This one-off custom build comes from the brains of a moto-journalist who is also a dedicated fisherman and, apparently erstwhile adventurer. 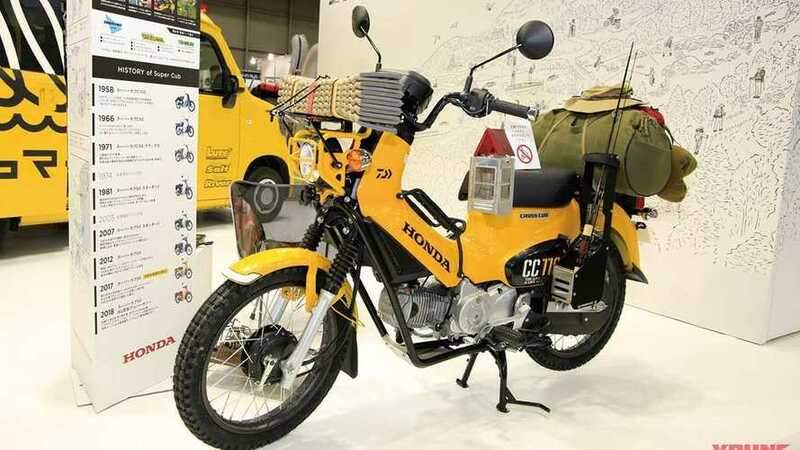 He chose the Japanese-market-only Cross Cub, a spinoff of the Super Cub that is slightly more ruggedized (less bodywork, knobbier tires). This one, though, gets extra off-road treatment in the repositioning of its exhaust from running under the bike to a scrambler style high pipe. This leaves the underside free of encumbrances so that the builder was able to fit a good bash plate, mounted on a crash bar that doubles as a frame member. 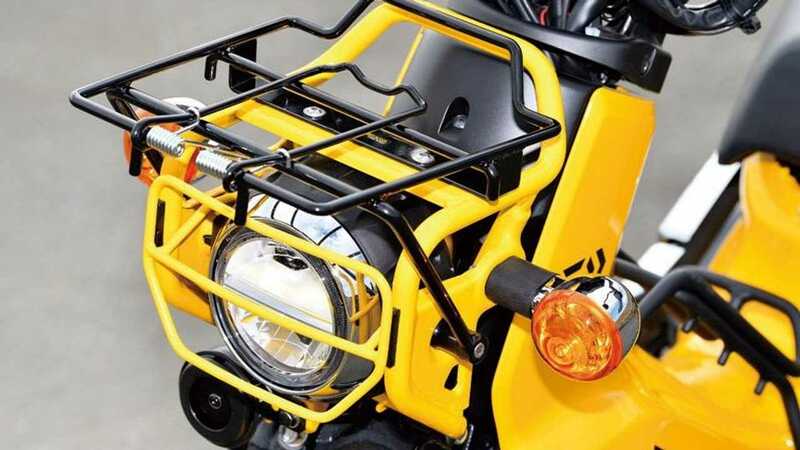 This bike has a front rack with headlight protection, as well as rear and mid luggage racks. Remember it’s a step-through so that middle bit of frame can also be used for extra luggage. While some of this is totally custom, many parts of it are available for purchase on the Japanese market, making this a do-it-yourselfer’s dream. You can just bolt parts onto your own Cross Cub, if you live in Japan, and take this thing fishing and camping too! It’s light enough that it’s probably a real hoot on dirt roads. 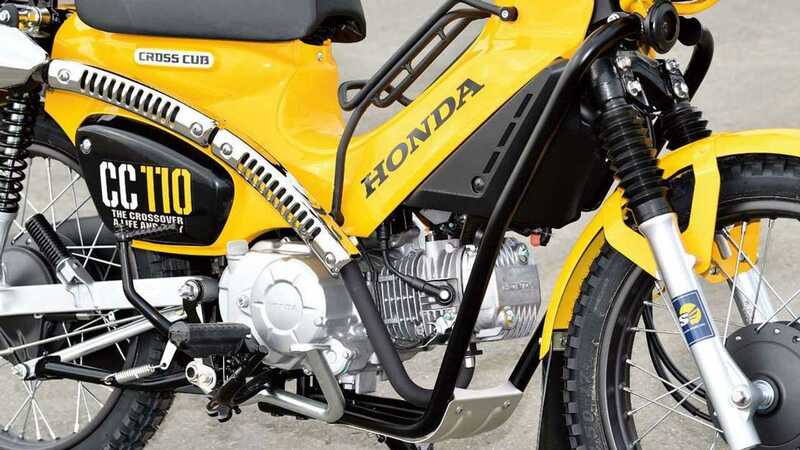 This cross-cub has a 110cc motor, but if you live in the US and you are dedicated, you can buy yourself a 2019, 125cc Super Cub and use this build as inspiration for your own. This machine was on display at the Japan Fishing show in January, where it drew attention for being simultaneously useful and adorable. It will be on display again at the Tokyo Motor Show on March 22-24, 2019. “Outdoor enjoyment specification is completed!” Hopefully the Super Cub will sell well enough here in the states to draw a following and inspire customization projects like this one.